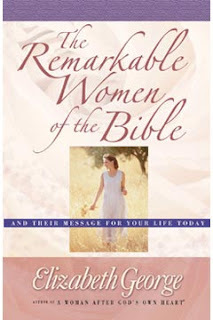 Now I'm "grown up" (har, har) and I was provided an opportunity to read and review her book The Remarkable Women of the Bible: And Their Message for Your Life Today . It was like coming home! Normally I don't like being called "dear one" and the like but when I'm reading Elizabeth George books, I can just tell that she means if. I feel like she's just sitting in front of me being extremely excited that she is able to share these truths. If ever a woman exemplified the spirit of Titus 2:3-4, Elizabeth George would have to be the one (for me). In reading this book, I felt like a little girl who was able to curl up on the sofa with a cup of tea and just listen to an older woman encourage my spirit and teach me how I can be a better wife, mommy and person. I can't tell you why George has this effect on me. I can only tell you that she does. I still want to be like her when I grow up. In this particular book, The Remarkable Women of the Bible, George focuses on the lives of the following women in scripture: Eve, Sarah, Rebekah, Jachebed (and her remarkable name, eh? ), Miriam, Rahab, Deborah, Ruth & Naomi, Hannah, Esther, Elizabeth, Mary, Martha & the other Mary, Dorcus, Lydia, Priscilla, and Phoebe. Whew! That's quite a list! George draws out practical applications from each one of these women's lives. Yes, you might be familiar with these women but George takes the time to show you how you are so much like them and have so much that you can glean from both their successes and their failures. However, in true Elizabeth George fashion - she looks beyond the negatives and just reminds us that God's faithful mercy covers a multitude of sins and even though these women made mistakes, just like we do, there is nothing that God cannot use for His glory and benefit. For me, I identified most with Eve, which I thought was rather surprising and unexpected. I was thinking I'd glean more from, say, Esther or someone who is generally looked upon with favor. (And so I admit my weakness to you now.) Now, I'm a firstborn with all the characters qualities *ahem* that accompany that position! My parents learned on me and I made it difficult. I've always had an independent streak and a mind of my own. Although there are perks to being the first kid in the family - there are also disadvantages. Everything I did was new and different and therefore not exactly trustworthy. That's a hard position to have when you have an idea for a good time that has never been proven before. Same with Eve. She was the first. She got to make the biggest mistake that we women get to grumble about for the rest of eternity. She didn't know how to be a woman. She didn't know what childbirth would be like. She didn't know how to be a mom. She didn't have Facebook, Twitter, Blogger and e-mail to help her figure life out. She was alone. And first. And I think there should be some grace in that. I've never seen Eve in such a sympathetic light before. Mostly I've just spent my life irritated with her. Really now! How hard could it have possibly been to not talk to a serpent?! You gotta wonder. But grace, Carrie, grace! Right. I think I understand a little more in light of a "firstborn." I'm probably way more like her than I'm ready to admit. Do you think this would be a good book for a 13 year old? My daughter just turned yesterday and I have been thinking a lot about my responsibility in teaching her what it means to transition from childhood to being a young woman. Perhaps this is a book that would help in that area and compliment what she is learning in her confirmation classes. I read A Woman After God's Own Heart 1 1/2 years ago, and it changed my life! And guess what?! I'm going to see Elizabeth George this weekend! I'll have to check this book out. I'm trying not to go crazy buying books while I'm there...but I seriously CAN.NOT.WAIT. Yes! EG is tasteful enough to hand over to women or young ladies. For me, it was always the excessive use of exclamation points -- I have a tough time reading a book by someone who punctuates every other sentence that way. But I don't think I gave her enough of a chance, so perhaps I should go back and try again. Theologically, she's definitely sound, and that should be the starting point of my criteria (instead of punctuation...). Thanks for the review. I'll have to look for this one. I'm reading a book now by Jerram Barrs titled Through His Eyes: God's View on Women in the Bible. Really good, too. Blessings - B. One of my favorite authors!! I am considering of A Woman After God's Heart for my next book club.